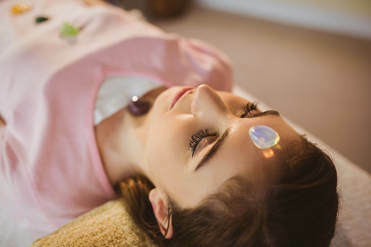 Crystal Healing is an ancient healing modality that helps with healing clients through the precise placing of crystals on the body and the surrounding room in a grid like pattern. Crystal Healing dates back thousands of years. It is based on the premise that crystals can penetrate through their electromagnetic field to communicate and connect with the energies flowing throw your body. It is a non-invasive, relaxing, natural and enjoyable modality. Your physical body contain crystalline particles and a range of of minerals that are uniquely related to Earth. Your body is made up of 70% water and water has a crystalline structure, think about snowflakes. I offer 7 different techniques all are 30 minute sessions for $65 and distant sessions are $55. All can be done remotely or in person. Clears away awareness and releases blocked energy. It is helpful when you’re felling unsettled for no apparent reason. With the release of stress, sensations may seem to increase before they subside. This healing modality provides a good every day balancer and restores a natural flow of energy. This procedure can be used to recharge and balance the bodies energy centers or the chakras. This healing will help with any experience that affects us on emotional level and is held within the body, stress is particularly bad for this. The stress hormone, cortisol, is public health enemy number one. Scientist have known for years that elevated cortisol levels; interfere with learning and memory, lower immune function and bone density, increase weight gain, blood pressure, cortisol, and heart disease. This crystal healing can be used to give you a “feel good factor” boost, especially if you have been feeling a bit down. If you are feeling disconnected from the world around you and or your spiritual self this will help you re-engage that connection. The following can only be scheduled 1-2 times a week due to their power and full body clearing. This healing works on activating the energy field around the body. It is a vibrational field around the body that used to spin but for many clients lies dormant, it has the power, once activated, to protect the physical body, raise the psyche, and much much more! This Crystal Healing revives sluggish energies when we feel agitated, it can be localized to any area of the body that needs supporting to come back into health.